This post is sponsored by Folgers®coffee. It's never too late to incorporate fun family traditions into your holiday festivities. Here are 12 Traditions from our family to yours that will help you to create lasting memories with the ones you love! The holidays are a time of year when families come together and I just love family traditions. 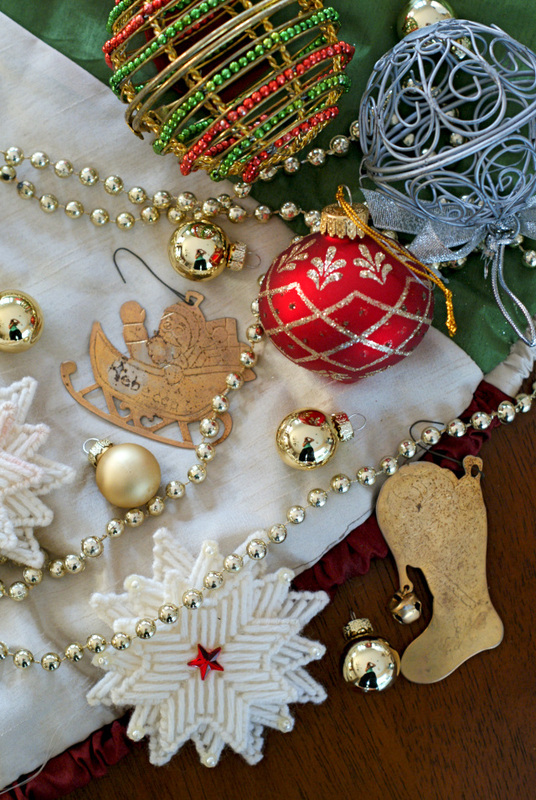 Growing up, our family had lots of holiday traditions that we enjoyed year after year. My sisters and I have long since grown up and started our own families and, now that I'm a mom myself, I've started traditions with my two kids! Some of the tradition are old and some of them are new, but all of them are helping to create lasting memories for our family that we will cherish for years to come. When I look back at the old traditions and think about new ones, too, I noticed that many of my memories are made while sipping a hot cup of coffee. Like me, Folgers is dedicated to family traditions and I love that many of my memories are made with a cup of Folgers in my hand! I've created a list of 12 Holiday Traditions to share with you that I enjoy with my family, and maybe you can share them with the ones you love this year, too! Kick off the holiday season with a festive advent calendar! 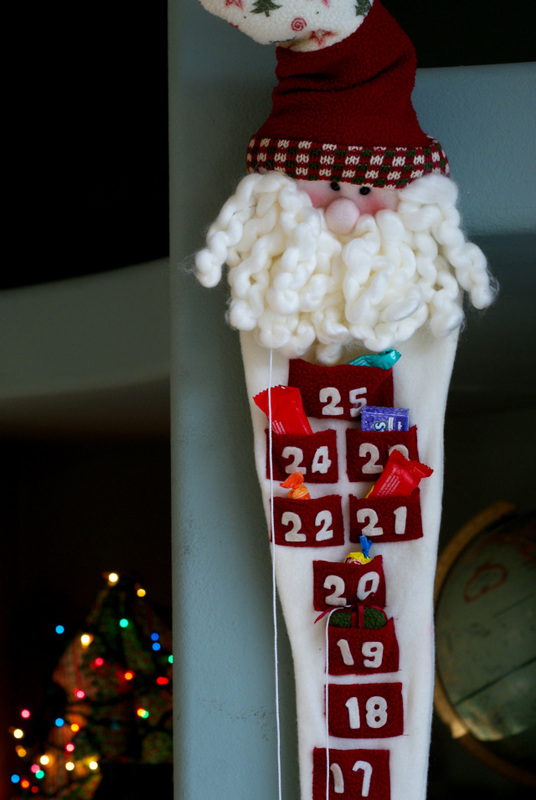 Tip: If your advent calendar has slots for treats, set aside some fun size candy bars after trick-or-treating on Halloween! They are perfect for filling the little slots. Every morning, I sip on my coffee while the kids take turns counting down each day. I let them eat the candy with their breakfast which is a very special treat that only happens on holidays! Every year, my sisters and I gather at our Mom's house for a cookie baking extravaganza! We bake enough cookies for each of us to take home a big plate and enough to mail some to our grandparents, too. 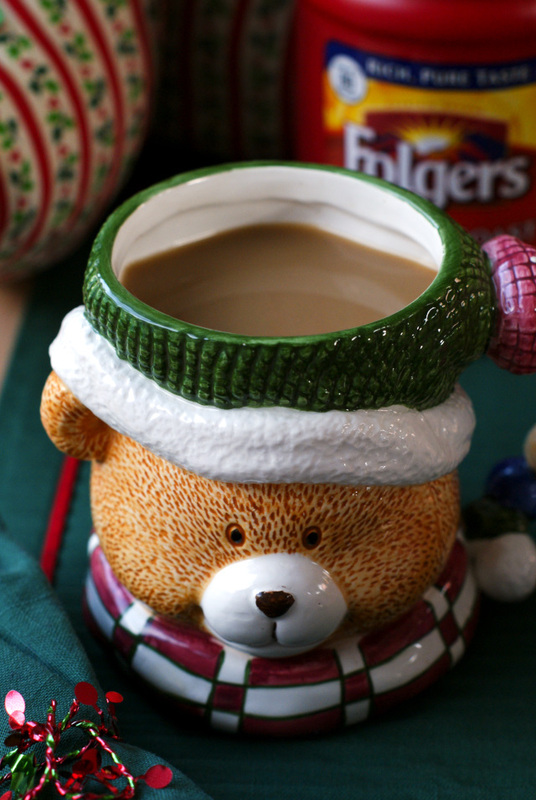 I think this year I'll make bring all the fixins for a holiday Folgers coffee bar! What do you think, girls? A trip to the mall to sit on Santa's lap is like a childhood right of passage. I'm not sure how long it will last, but for as long as the magic is alive in their pure little hearts, I'll be laying down the dough for a fast pass to get 30-second meet and greet with the big guy so that my daughter and Santa can discuss their love of books. And, of course, we'll need to document the moment with the obligatory overpriced photo package! Looking back...I can't help but smile! 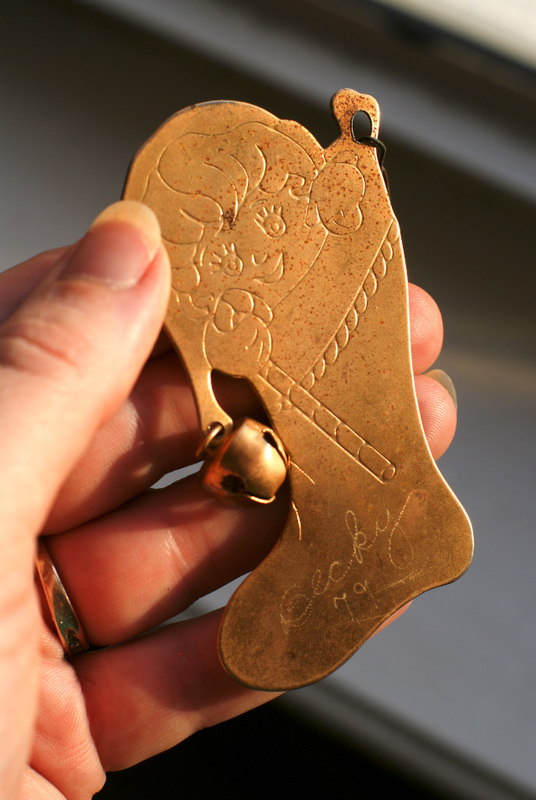 When I was a little girl, every year my parents bought my sisters and I Christmas ornaments with our names engraved on them. During our annual Tree Trimming Party (See #5! ), my favorite part of the evening was sorting through the ornaments searching for the ones engraved with my name so that I could hang them on the tree. They still hang on my tree every year right alongside the ornaments that are engraved with my children's names. I love our annual Tree Trimming Party almost as much as I love Christmas morning. Make it a fun event for your family! Every year, I cook out favorite snackers like Buffalo Wings and Sausage Cream Cheese Dip. We play our family's very favorite Christmas albums and the whole family works together to decorate the tree. After the kids go to bed, I like to turn all of the lights off except for the tree and snuggle in on the couch with a cup of coffee, enjoying the new memory we made as a family. I save our Christmas cards every year and tuck them into a box instead of tossing them in the trash. The next year, I pull them out and cut the images on the front of the cards into gift tag shapes. A hole punch and a little ribbon are all you'll need to make cute custom tags! 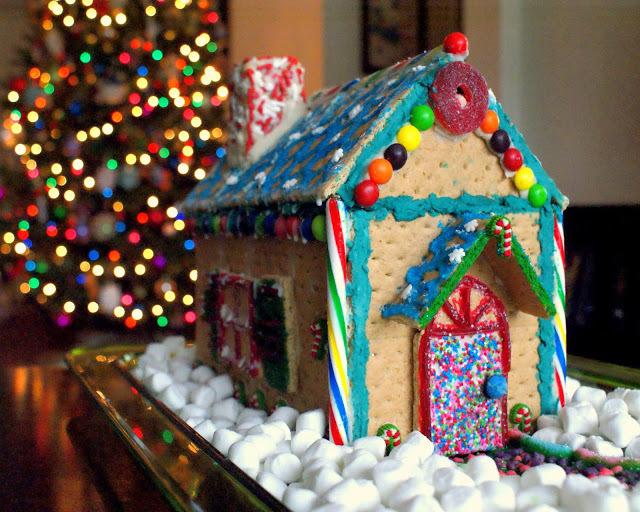 Making a fun and festive gingerbread house can be as easy as gathering some graham crackers, icing, and sprinkles. It's a fun way for the kids to unleash their creative sides! You can follow my simple instructions on How to Build a Graham Cracker Gingerbread House here and then head on over to Taste of Home's Gingerbread BLVD to vote for your favorite Gingerbread House of the season! Spread the joy of the season by sharing random acts of kindness! 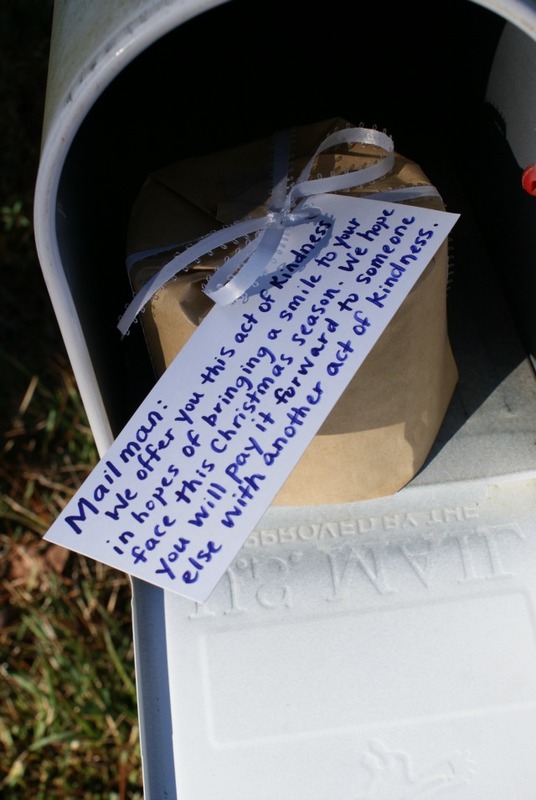 One of our favorite ideas was to wrap up a can of Folgers with a note for the mailman! We love the idea of surprising people with kindness all season long. The big day has finally arrived! On Christmas morning, as soon as the kids are up we head to the tree to see if Santa came. They only rule on Christmas morning is that the kids have to wait for Mom and Dad to get their coffee before we start opening everything! This gives us old folks a chance to rub the sleep out of our eyes and gives the kids a chance to really enjoy the moment and soak everything in! After the hustle and bustle of the day, Christmas dinner shouldn't stress you out. Our family had the tradition of serving stuffed shells on Christmas! We buy them frozen, so all you do is pop them in the oven. No stress and a delicious way to end the holiday. Think of a meal that your family will love and one that won't have you cooped up in the kitchen all night. You should spend the day enjoying your loved ones! 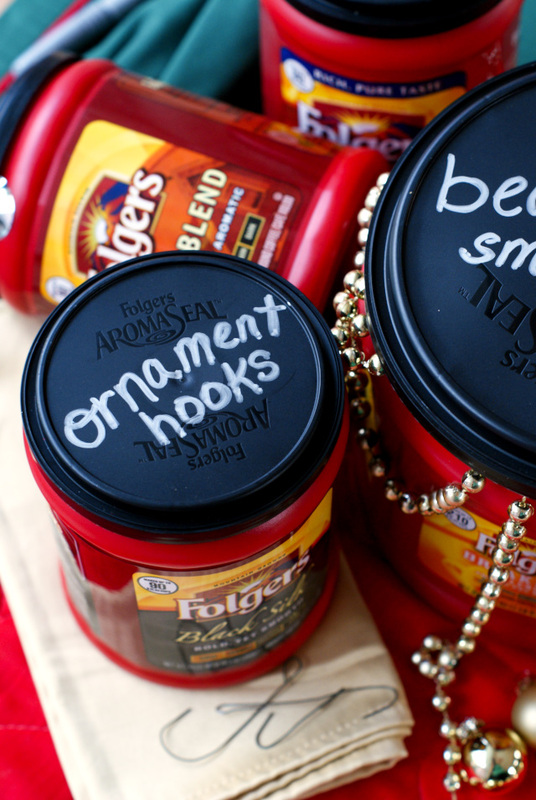 When it's time to take down the twinkle lights and tuck away the ornaments until next year, don't forget to let Folgers help you keep things organized! My Mother says that when she was little coffee cans were the perfect storage solution for leftover Christmas cookies! I like to use Folgers coffee cans for storing ribbons, tags, ornament hooks, and spare twinkle light bulbs. Organization should totally be a tradition! What memories will you make with your family this year? For lots of awesome holiday inspiration to help you make memories with your family this year, follow Taste of Home on Twitter and Facebook and don't forget to gather the kids around to vote for your favorite Gingerbread Houses on Taste of Home's Gingerbread BLVD! I can't wait to continue my beloved traditions with my kids, my mug of Folgers in hand, and I hope I've inspired you to start a few with your family!